I have owned parrots since 2008. Now, 7 years later I have 4 parrots, 30,000 subscribers on youtube, over 17 million views, and selling thousands of copies of my book. I would like to thank all of my subscribers, followers, readers, and fans for being a part of the whole Parrot Wizard experience. I am really happy to be sharing this with you and helping you achieve a great relationship with your bird as well. Kili knows over 30 tricks and I have actually lost count. The coolest thing is that she just knows how to work with me so I can come up with cool new videos like (Kili Swift Shake it Off) without specifically having to train anything new. We use commands that she is familiar with or she learns her new cues on the spot with a clicker. She is just a star actress. 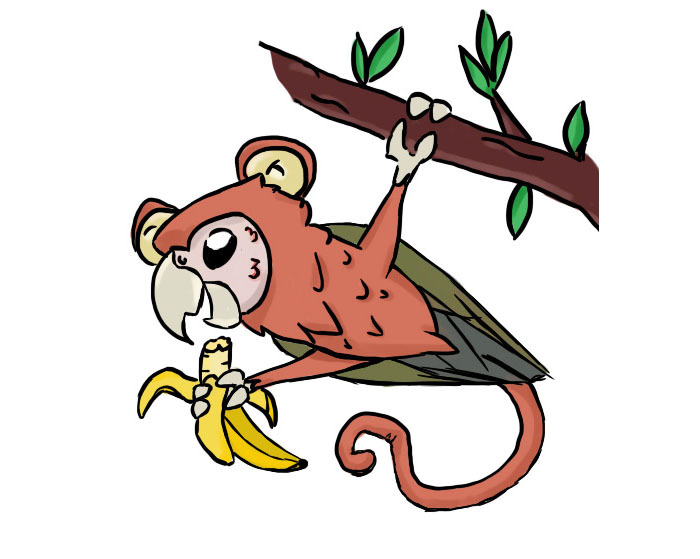 Truman is a total monkey bird. He is always making a mess or getting into some kind of trouble. Still, he's the most lovable bird in the family and impossible to get mad at. He's very cuddly and hand tame. He is my go to bird for letting people hold. He has literally never bit anyone ever. Santina is the rescue bird and still working on her skills to get along with other people. She was featured on my Harness Training DVD about how she learned to wear a harness in just a week! I am working full time being a Parrot Wizard. When I'm not doing shows, consultations, or seminars, I am busy developing new tricks and products to sell. 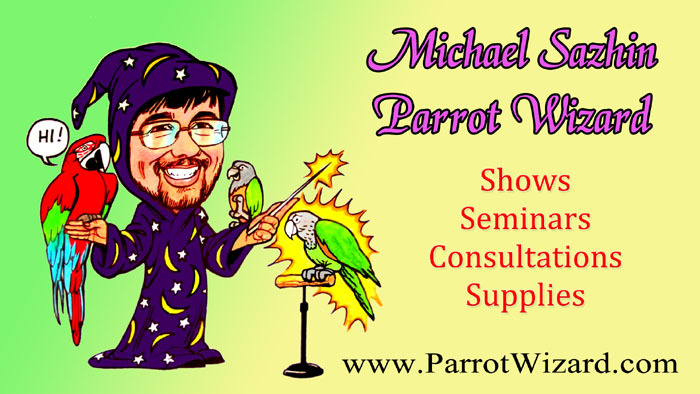 In my Parrot Wizard online store you will find a collection of products I have hand selected or invented to make parrot keeping more enjoyable. Trick training toys, perches, books, DVDs, and Parrot Training Perches can be purchased on that site. 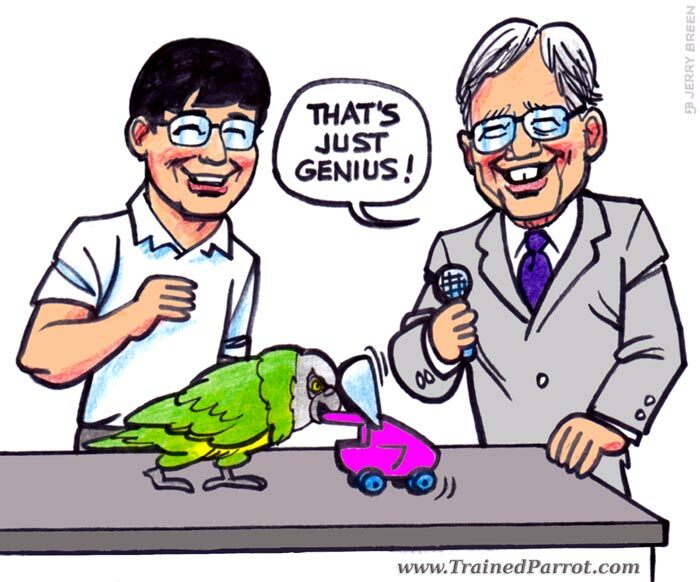 My book, The Parrot Wizard's Guide to Well-Behaved Parrots contains my complete approach to parrot training. It is exactly the system I have used on all of my parrots and the system that I recommend to other parrot owners. It is a lot of information so it took an entire book to contain it. 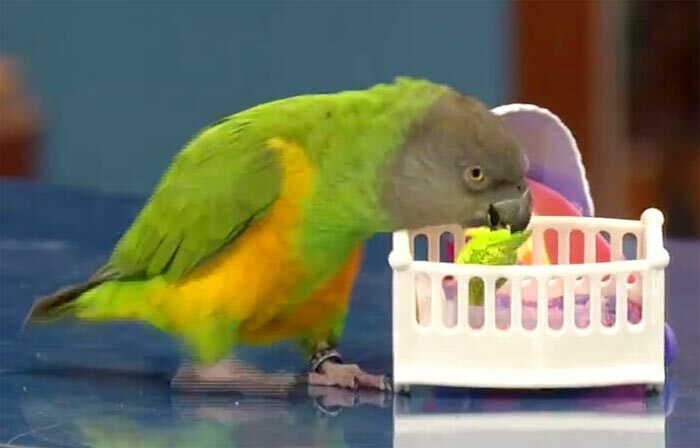 I am available for parrot shows for TV, general audience, or parrot clubs. Please contact me if you are a producer or organizer. I travel a lot, so there are occasionally opportunities to come and see one of my seminars in the US or around the world. I live in New York City and am especially available for events in the area. 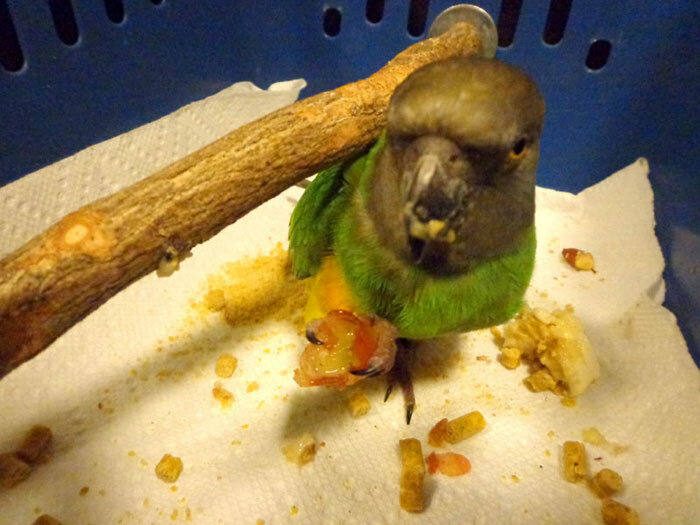 You can follow little day to day updates and picture on the Trained Parrot facebook page. I continue to work on new videos, tricks, and products. Thank you for watching and stay tuned for more exciting blog articles! 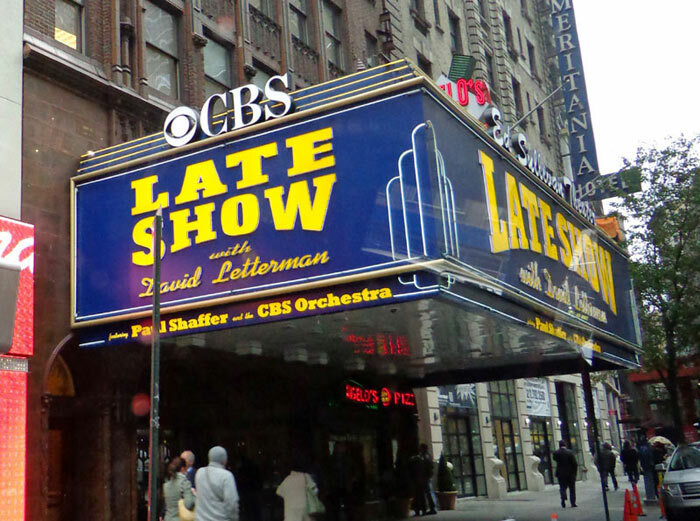 My pet Senegal Parrot Kili performed on the Late Show with David Letterman on Tuesday November 13, 2012. She played off her maternal skills by holding her toy baby, pushing her around in a stroller, and then rocking her asleep in her crib. We had a lot of fun and a great time on the show. Now for my loyal readers I will offer a play by play analysis of how the trick went. 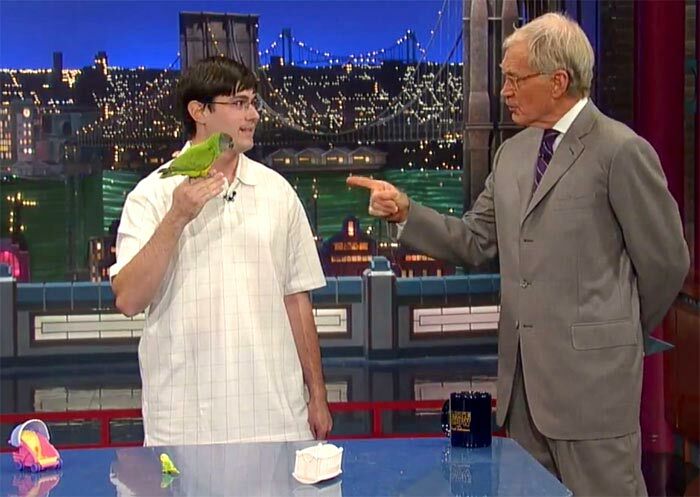 Right after coming out I shook Mr Letterman's hand with my right with the bird on it because clicker and treat were tucked in my left hand. I had to keep Kili's foot clamped with my thumb while speaking to the host not because the bird wanted to get loose but because she was dying to do the trick. She was like "would you just shut up already and let me do my thing!? GAH!" When David brought up the age thing about the bird outliving me, I didn't feel like getting into the specifics about how Senegal lifespans are closer to 30 years so I just left it at "I hope she doesn't outlive me!" for the folks paying attention. So when David brought up quirks/ticks, they showed Kili up close being all jittery, however it had nothing to do with this and all to do with the fact that she could see her props and was trying to rip herself loose from my hands and do the trick already. At one point I had to cup her against me to distract her and get her to stop seeing her trick. It took no effort to get her to do the trick because by the time all talking was done, all I had to do was let go and like a horse at the start gate of the Kentucky Derby she was off! Few realize this, but Kili picking up the baby with her foot is a whole trick in itself because parrots don't naturally do this. 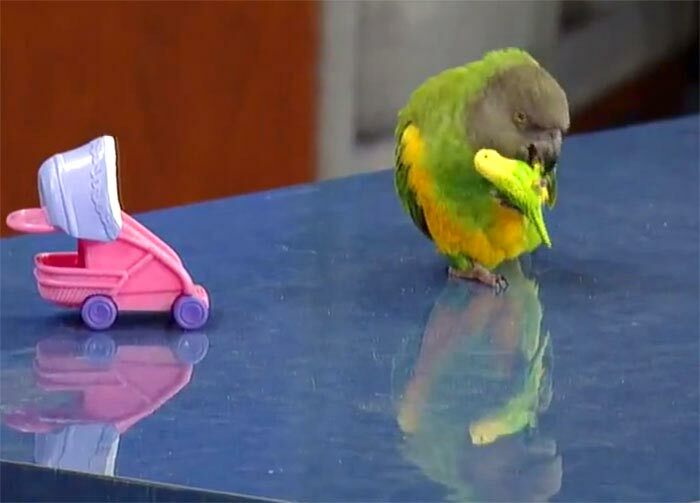 Normally they pick things up with their beak and then transfer them to their foot if they have to. Kili dropped the baby but quickly picked it back up to continue. Getting Kili to stay in the position and show how she holds the baby is also a challenge because she'd prefer to run along and continue the trick. The table top was a bit slippery but Kili managed to get by and push the stroller all the way across. She didn't realize to stop until she hit the crib though. This was mostly the result of an unfamiliar surface that she didn't get to practice the stroller push much on. Kili was posed with a major dilemma at the finale of the trick because she pushed the stroller up against the crib. She would not be able to put the baby in from the stroller side as she'd normally be accustomed to. But being the brilliant bird that she is, Kili simply walked around the crib and placed it from the other side! She finished off by rocking the crib a few times and waving goodnight to the baby (however, the camera angle doesn't really show this). She ended the whole thing off by flying back to me and got a sizable piece of almond as a reward. I intentionally stayed back away from the table and had Kili fly to/from to show the lack of involvement on my part, keep my hands off, and let Kili show everyone what she can do! After it ended Kili flew back to the table because she was looking for a comfortable place to chew her almond. I wanted to give her a big reward for doing a big job but later regretted it because it took her too long to eat and it was hard to get her to stay on my hand. 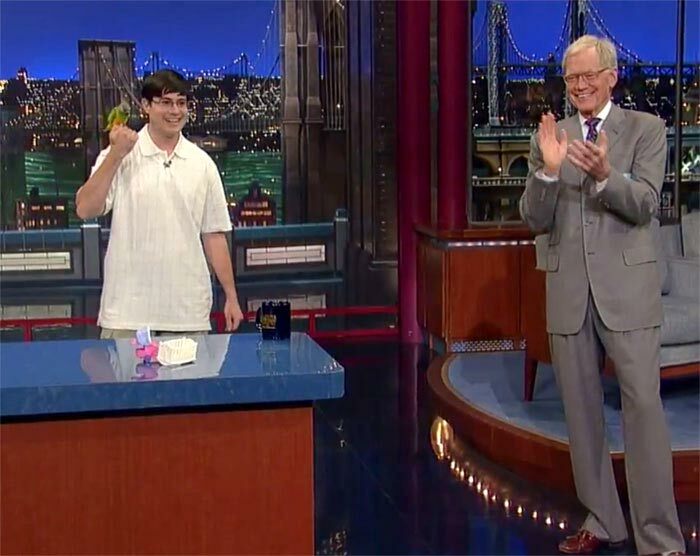 Finally there was that awkward moment where Letterman was like "oh you're back? There's always the guy who won't leave." That was really a gaffe on the show's part because I was told to walk off stage after shaking the hosts hand at the end but as I walked off the stage manager told me to go back out to watch the instant replay. Thanks a lot guys for playing me the fool when you can't even keep your procedure straight! After leaving the stage I got a banana and grape from the salad bar to reward Kili. While she was chowing on those I also threw in a load of pellets. She didn't know what to go at first and was thrilled to have everything. She rolled the banana around in the pellet powder and made her own treat out of it! The look on her beak was hysterical as all the pellet powder was sticking to her banana covered beak! I wanted Kili to celebrate her job well done by feeding her as much as she'd like to eat. So unlike the normally moderated portions, here she could eat as much as she want and she did! I left the carrier open but she wouldn't come out because she was so thrilled at her special meal. She porked up 21 grams (nearly 20% of her empty weight) without blinking an eye and might have kept going if I hadn't eventually taken away the leftovers. She was bloated beyond belief and looked like the slightest squeeze of her belly and she would pop. What I found even more astounding was that when we got home (and I went to train Truman, business as usual...), Kili still wanted to train and did a few flight recalls despite the fact that I didn't expect anything at all from her. She recalled to go back in her cage for one final pellet! Thanks to everyone for watching and being supportive of the training efforts to date. I hope you enjoyed our performance. 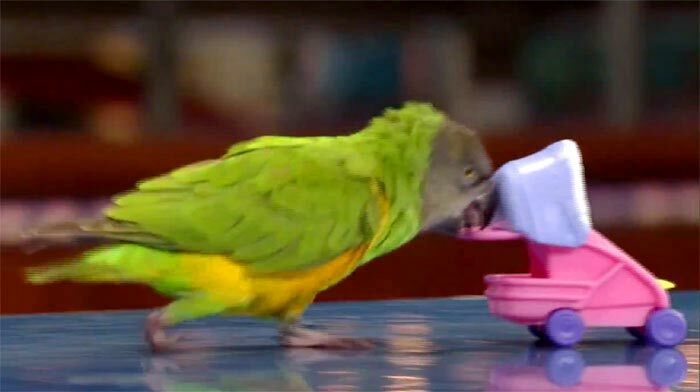 If an average guy like me can teach his ordinary parrot all these tricks, then there is little doubt in my mind that any and every parrot owner can develop a simple loving/caring relationship with their parrot. 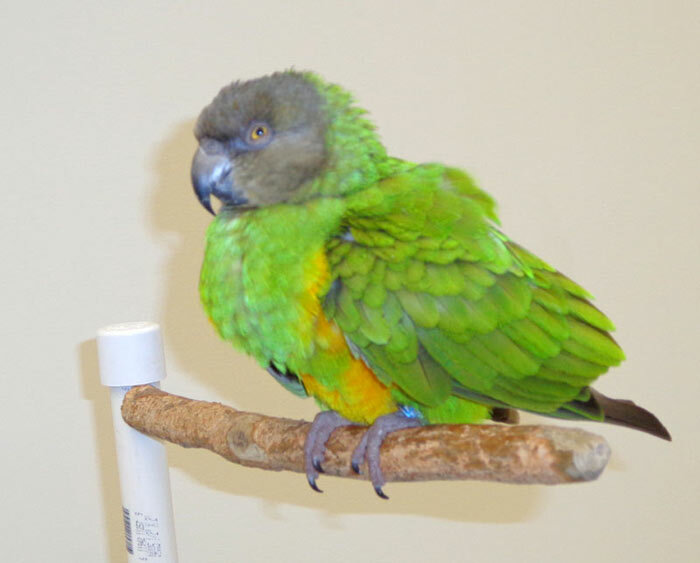 Your parrot doesn't have to be the world champion performer but by applying comparable techniques including positive reinforcement training, taming, socialization, flight, food management, steady schedule, love, and patience you can have the same relationship. The greatest victory of all of this is the relationship that I have with this bird. A few years ago she was becoming a biter and difficult to manage. Now anyone can hold her, I can travel with her, and she is just a wonderful pet. My blog, forum, and store are here to help you so please take advantage. Private consultations are available.